Have you ever found yourself wondering what happened to those two beloved Italian plumbers in the Super Mario Bros. franchise? What if, instead of inspiring new games and merchandise, they matured and grew older, just like the rest of us? That is the exact scenario Jump Man! A Mario Musical, playing now through August 24 at Theatre 80 (80 St. Mark’s Place), contemplates. In this hilarious new musical, we see one possible version of what might have befallen our favorite fraternal super heroes had they given up fighting evil and resumed life as average citizens of the world. Jump Man! imagines what life would be like if Mario and Luigi gave up trying to save the world from evil. Mario is married to Princess Peach, and he’s leading the life of an average unhappy plumber, wanting nothing more. All of a sudden, people from his Brooklyn neighborhood mysteriously start vanishing, and Mario is called upon to pick up where he left off in his saga of fighting crime. Jump Man! features a book, music, and lyrics by Sam Pitt-Stoller, direction by Myla Pitt, and Choreography by Pitt and Michi Osato. Jump Man! has many strengths in its writing, most notably in the extremely clever lyrics featured in many of the songs. A personal favorite of mine was “The Lesson,” a song in which Mario teaches a young child a valuable lesson about adult life. (I’ll leave it to you to go see it and figure out what that means…) He also features many clever jokes in the book of the musical, most featuring self-aware humor. The group ensemble numbers seemed a bit confused at times (which may have also been the product of a less than stellar sound system), but with some work they could be wonderful. One of the best composed songs was “Personal Hell,” sung with deliciously evil skill and flair by Alexa Green as Jarles Jarwin. Another impressive showcase was Luigi’s first song called “Sidekick Song” (in which Benny Oyama impressively accompanies himself on mandolin) in which he laments constantly being second banana, while using an impressive array of examples of famous sidekicks. The cast is very strong as a unit, but a few individuals are notable standouts. Mario and Luigi (played by Jeff Essex and Benny Oyama, respectively) are both extremely talented and effective in their roles. Luke Schwartz as Toad brings much needed fire to some of the scenes, and constantly brought the laughs throughout the show. Most impressive, however, was Alexa Green, playing the villain of the piece, who brought the house down with her delicious delivery of her villainous dialogue and powerhouse delivery of her music. Overall, I enjoyed Jump Man! It was an enjoyable evening of entertainment, and it definitely has potential. However, in order for it to have a commercial future, a few things need to be worked on. The transitions between scenes must be tightened, some dialogue could serve to be cut, and the music should be of more consistent quality. The raw material that is there is good, but the show could be even better if certain elements were tightened. Regardless, go see Jump Man! 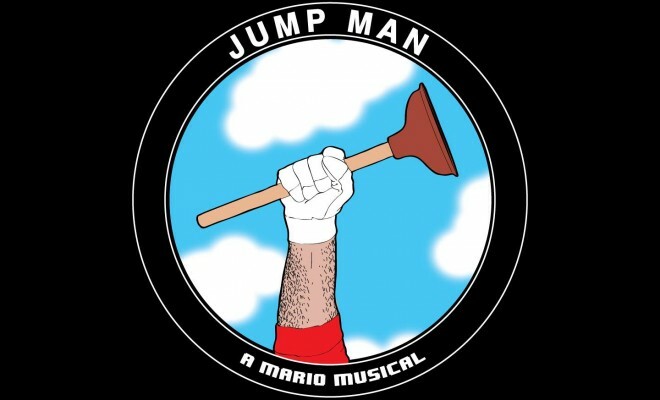 if you want to see a hilarious new musical that will have you wanting to dig out your Super Nintendo and start playing your favorite childhood games.